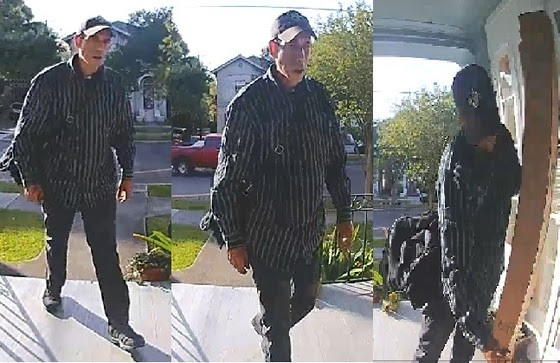 On March 28, at or around 5:26 p.m., a man approached the victim’s residence and removed a package from her front porch. The subject then fled the scene on a bicycle. Anyone with any information regarding the suspect’s identity or whereabouts should contact Second District detectives at 504-658-6020. Citizens with information that can help solve crimes are asked to call Crimestoppers at 504-822-1111. A man was arrested in the stabbing of woman in a home on Toledano Street, the New Orleans Police Department reported. At about 11 p.m. on Monday, April 8, Javon Johnson, 41, was arguing with a 23-year-old woman over drug use in the home in the 3500 block of Toledano, the police report said. Johnson allegedly struck the woman, knocking her to the floor. Police said he then took out a straight razor and slashed her left wrist. The victim was taken to a hospital for treatment, and Johnson was arrested at the home. Anyone with any information regarding the suspect’s identity or whereabouts should contact Second District detectives at 504-658-6060. Citizens with information that can help solve crimes are asked to call Crimestoppers at 504-822-1111.